The achievement of desirable hemoglobin levels in renal anemia that is treated with epoetins is often incomplete and subject to much variation of outcome values and applied dosage. The further development of clinical decision support for renal anemia requires the characterization of patient responses and an analysis of the dynamics of the dosage and response variables. In this methodologic article, the extended data of a randomized, controlled clinical trial comparing two epoetins were examined by the techniques of functional data analysis to establish how precisely the patterns of treatment response might be described and analyzed. The description of the trajectory of hemoglobin values in each patient as a mathematical function allowed the characterization of individual responses, with a wide variety of patterns being revealed. An analysis of the degree of system control in the management of the anemia was then possible through phase plotting. The analysis also allowed an expression of the dynamic characteristics of the entire experimental system, analyzed in summary group waveforms with standard statistical properties. In addition, a quantification of the notional instability of patient responses enabled the determination of a subset of patients for whom control might be improved in a modified management system. It is concluded that functional data analysis does provide the basis for further characterization and experimental study of the control of renal anemia. Any attempt to produce a comprehensive system for clinical management of renal anemia requires a complete description of the dynamics of Hb and epoetin at the individual patient level, preferably free of major assumptions concerning an underlying time series linearity or periodicity. We present here a methodology on the application of functional data analysis to this problem to investigate the proposal that such an approach will allow the description and analysis of the dynamics and control of renal anemia at the patient level. We used the data set of a comparative study of two epoetins.16 That study was based on a strict management algorithm, which defined group Hb intervention thresholds and used a single epoetin dosage ladder for serial increments and decrements of epoetin dosage in response to monthly changes in individual Hb levels. It provides a structured context for this investigation. 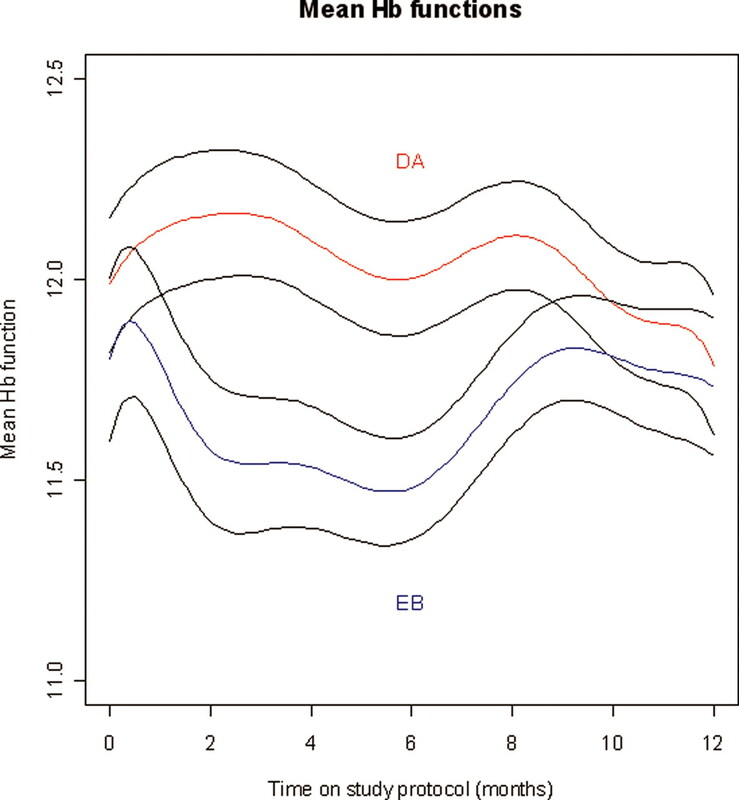 Many patterns of Hb waveform variation were revealed by fitting a B-spline function, some appearing to be sinusoidal and others irregular (Figure 1; consecutive study patient data are shown). The amplitude of the waves also varied widely. Because the time frame and number of data points were limited, no attempt was made to subcategorize the wave patterns. The deviation from the desired control value (11.5 g/dl; horizontal line) is apparent in each case, indicating the instantaneous degree of control that was being achieved. 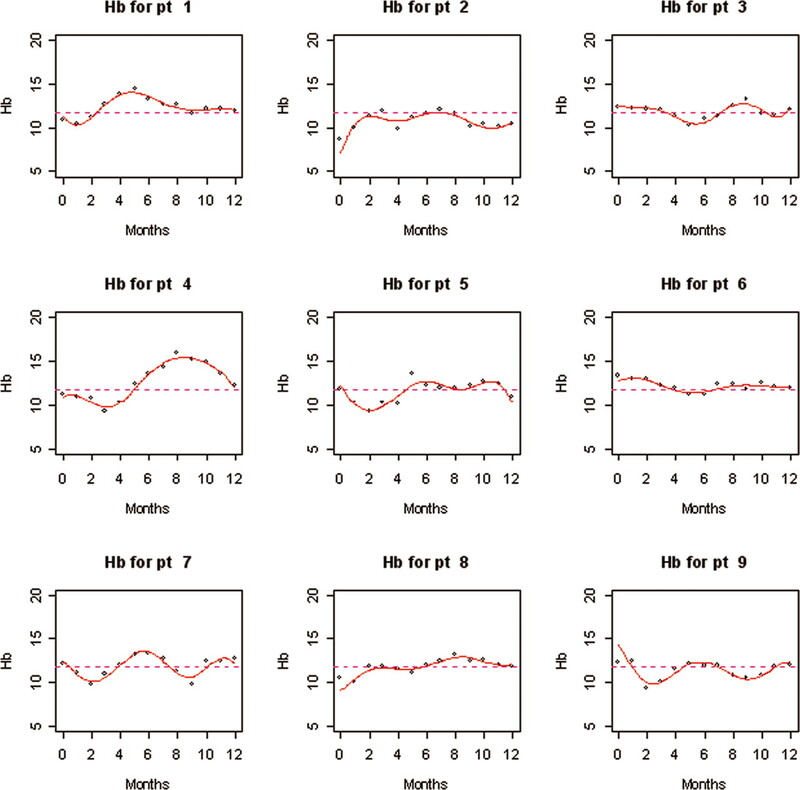 Graphs showing the fitting of B splines to the data from the first nine consecutive patients in the study.16 °, measurements taken each month; red line, the fitted B spline. Note that the optimum value for hemoglobin (Hb) of 11.5 g/dl is also shown as a horizontal dashed pink line. Plotting the Hb trajectories in the phase plane (i.e., plotting slope [g/dl per mo] against Hb level) allowed review of the degree of control achieved by the algorithmic feedback system during the 12-mo period (Figure 2). The phase plots revealed a range of control spirals that expressed the effectiveness of controlling Hb close to the desired value. For instance, patient 7 is controlled, but his or her Hb level oscillates around the target value. Consequently, the patient's phase plot appears as a curve that remains a little away from the origin; this may be a sensitivity issue. In contrast, although the curve of patient 8 starts away from the origin, it spirals in toward it, indicating that the patient is coming under closer control. Similarly, patient 9's spirals inward. The graphs on the right are phase plots, being the first derivative (slope) of the Hb trajectory (shown on left in each case) plotted against the Hb. A tight spiral in the phase plot indicates good control. The red dot indicates the start of the trajectory in the phase plane. The group-mean data display the comparison between the two agents (Figure 3). Starting from a common baseline, the group-mean data diverge and then converge by the end of the study. The scale of the ordinate (Hb) is fine for study plots of this type. The statistically significant separation of Hb values, between 2 and 8 mo, and the subsequent remission are apparent. The two group means of the study,16 complete with 68% confidence envelopes. Where the confidence envelopes do not overlap, the mean values are separated by at least 2 SE and thus indicate where significant differences occur. DA, darbepoetin; EB, epoetin β. It is clear that the conversion of epoetin β from thrice weekly to weekly resulted in marginal but detectable group undertreatment that the clinical decision support system (CDSS) corrected over time. By contrast, the conversion at a rate of 200:1 of darbepoetin produced an overtreatment, which again was corrected in the subsequent months. Instability was calculated for all patients. The mean value for patients who received epoetin β was 0.58 g/dl per mo (SD 0.29 g/dl per mo) and for darbepoetin was 0.68 g/dl per mo (SD 0.26 g/dl per mo). A two-sample t test indicated statistical significance at the 5% level (P = 0.03). 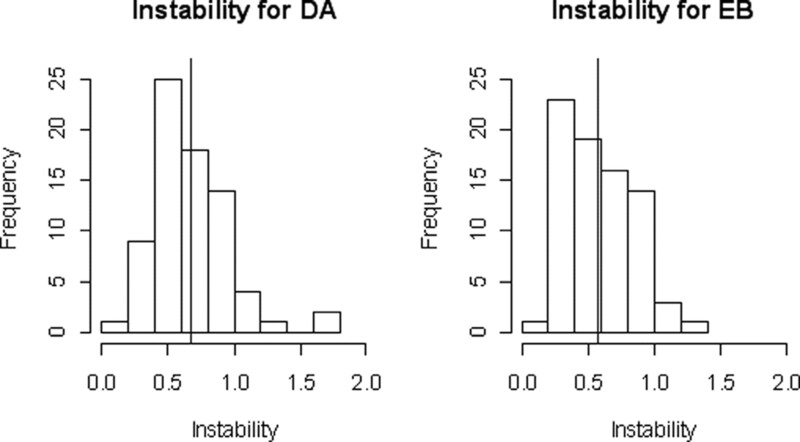 Figure 4 shows histograms of the instability values for the two groups. Note that almost all patients exhibited some degree of instability. For the majority of patients, the instability was small, typified by the overall mean value of 0.63 g/dl per mo, compared with the range of values of Hb that is acceptable: 10.0 to 13.5 g/dl. There are a number of patients, however, for whom the instability was double the mean value, and an instability of >1.0 g/dl per mo during a 6-mo period indicates either considerable oscillation around the range of acceptable Hb or excursion beyond the desired control values. For instance, the Hb trajectory for patient 7 in Figures 1 and 2 represents instability of 0.94 g/dl per mo, and it would be desirable to dampen the oscillations generated by an oscillating epoetin dosage history. Histogram of measure of instability for the 151 trial patients (the vertical solid line represents the mean). The management of renal anemia lends itself to a decision support approach, through the adjustment of epoetin dosages in light of Hb values. This is typically designed as a negative feedback system. Feedback control originated in the attempts to improve antiaircraft gunnery in World War II and was put on a mathematical basis by Wiener.17 Several properties of feedback loops determine the control that can be achieved, especially the “gain” of the system, which corresponds to the sensitivity of Hb responses to epoetin, as defined here. The frequency of measurements can be standardized, but other properties of the anemia system and patient idiosyncrasies are inevitably less well defined. The comprehensive characterization of patient responses and the dynamics of the system are essential to the design of improved methods of anemia control, preferably with minimum assumptions about the patterns of response. The technique of functional data analysis is a plausible candidate for such descriptions. Feedback algorithms are said to be widespread in the management of renal anemia but have been regarded typically as a local technical exercise that did not deserve exploitation and publication. Two early efforts were not developed, apparently.12,14 Our group has provided a logical justification for clinical intervention by feedback, based on unit-wide defined thresholds of Hb, and used such systems in routine multicenter clinical practice for >8 yr.18 We have also used the system in experimental studies, latterly to compare epoetins.16 The data of this work were taken from this comparative study, extended by 3 mo of subsequent continuous algorithmic control. The functional data analysis allowed a description of serial data for individual patients, without any assumptions regarding Hb or epoetin control, except that of a smooth trajectory of change over time. The data show trajectories that vary widely and form a continuum, rather than obvious subsets.7 The elements of control to a mean value may be inspected individually through analyses of the trajectory plotted in the phase plane, using the slope of Hb over time versus Hb. These also show variable behavior, although the overall trends are apparent. The analogy with a pendulum invites conceptualization of the “swinging” of Hb around the 11.5-g/dl optimum value, which can be expressed qualitatively and quantitatively by these analyses. With the use of functional data analysis, there is no need for assumptions of linearity or particular periodicity in the data, the patterns of which fall out from the specification of each patient time series by B-spline application. Further work is required to explore how far such functions can be aggregated and used to design effective intervention protocols and to provide the basis for epidemiologic studies of clinical association. 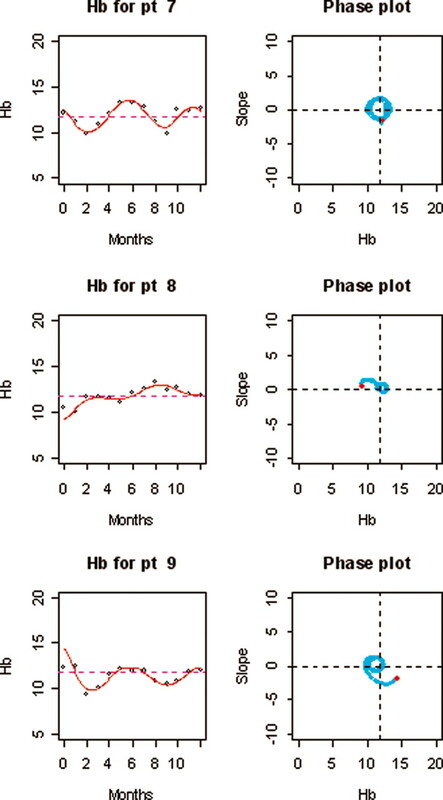 The multiplicity of Hb waveforms emphasizes the degree of idealization incorporated in the attempted precision of guideline statements and targeting paradigms concerning desirable Hb outcomes. The aggregate longitudinal mean and SE data confirm findings of the earlier study,16 extended to 12 mo in a diminishing per-protocol population. These results demonstrate the effectiveness of the feedback algorithmic system in the study groups, where perturbations of Hb, whether rising (darbepoetin) or falling (epoetin β), were corrected and returned to baseline. This is important because the experimental design was novel. The recruitment of the largely unselected patients meant that both Hb and epoetin dosages covered much wider ranges than in previous studies of this kind, which have concentrated on highly selected populations. The quantitative analysis of individual responses within the system revealed a continuous spectrum of measurable Hb instability, overlapping for each treatment group. The CDSS performed slightly better in terms of control for epoetin β rather than darbepoetin. This might reflect the design of the CDSS dosing steps using epoetin β. The pharmaceutical presentations of each agent and the initial conversion ratio (200:1, epoetin β:darbepoetin) will have a bearing on this, which cannot be taken to be a standardized comparative measure. The difference is negligible in clinical terms and indeed demonstrates similar experimental conditions for the two agents. Whatever the origins in patient or system control factors, the measure of instability is a tool for identifying patients who are at risk and for whom there is potential for improved control of Hb. Investigation may reveal that the excursion is associated with a known external influence, such as comorbid events, disease progression, or iron status, but there is also the possibility that the management system itself is provoking oscillation. These findings suggest two potential areas of research to identify possible incremental improvements of the management system. The first would be to modify the CDSS itself to account for the feedback mechanism and better regulate it. This would require guidance through past measurements as well as the current month's Hb level. Alternatively, more “sensitive” patients, who are shown to respond more strongly to epoetin dosage changes, may be treated with a dosage ladder or ladders with smaller “steps” than were used in the study. There is a clinical balance to be struck among the tailoring of dosage steps to each patient, the range of available epoetin presentations, and the logistical problems of servicing variable dosing efficiently and without error. These suggested approaches will require experimental proof in appropriately designed scientific studies. This initial formal analysis of an algorithmic system for anemia control confirms the properties that might be anticipated in any feedback system. In hemodialysis patients, it seems that a range of Hb instabilities can be expressed quantitatively and that such ranges are broadly similar for the currently available agents. The measurements suggest both the need and the form of studies that would support improvements in systems to control Hb levels. A more refined understanding of patient and system behavior should allow more focused and smaller studies of the control of renal anemia that are applicable to routine circumstances. Such methods should be at a premium, now that interest is shifting more toward the sustaining of outcome Hb values and the minimization of epoetin dosages. Functional data analysis is a promising technique for the further characterization of individual and group patient responses in renal anemia management, with the prospect of improved Hb and epoetin control systems. The bulk of the data used for the analyses were derived from a recently published randomized, controlled, comparative study that ran, by protocol, over 9 mo.16 A hemodialysis population, selected only by virtue of patient consent to the study, were randomly assigned to receive weekly epoetin β or darbepoetin, both subcutaneously, after conversion from thrice-weekly subcutaneous epoetin β. Conversion from epoetin β to darbepoetin was in the ratio 200:1. Blood samples were collected monthly, and the dosage of each agent was adjusted monthly according to fixed, high and low Hb intervention thresholds and standard dosage ladders using a CDSS. The study demonstrated an increase in Hb in the darbepoetin group at this conversion ratio. The management system responded with recommendations to decrease darbepoetin dosages, with a subsequent significant reduction of epoetin (darbepoetin) dosage. By contrast, Hb fell in the epoetin β group, in which CDSS recommendations led to a significant increase in epoetin β dosages. Population Hb values in both groups were returned to baseline Hb values by following the CDSS recommendations by the eighth month of the study. The 9-mo data set of the study was extended by the addition of Hb values and epoetin dosages from a subsequent 3-mo follow-up period, during which the study protocols were maintained. This gave 13 data points per patient: An initial value and then 12 more from the end of each month of treatment. No changes to the experimental protocol were introduced during the follow-up period, but of course further attrition of the per protocol population occurred. In the original trial, 217 patients were randomly assigned to two groups. At the end of the original trial, 162 patients remained on protocol after 9 mo, and at the end of the 3-mo extension, 151 patients provided complete data. Dropout from the study was largely due to mortality or transplantation and was not significantly different between the randomly assigned groups. Complete monthly data sets were available for all of the 77 patients who received epoetin β and 74 who received darbepoetin and continued to be treated by the system within their assigned randomization. The 13 data values of Hb for each patient cannot be regarded as independent observations, because measurements on the same patient at different times will be strongly correlated. It is more appropriate to consider them as a Hb trajectory. This trajectory is a continuous function that takes values at all times, although measurements were available only once per month. After a change in epoetin regimen or dosage, a patient's Hb level will change smoothly over time. Consequently, it can be assumed legitimately that the Hb trajectory is a smooth function that passes through or close to the measured values each month; there may be some small measurement errors. The smoothness of the Hb trajectory is valuable and becomes a key component in the following functional analysis. A common mathematical approach to fitting smooth functions is to fit polynomial “splines.” These are functions that, over a given limited range (between data blocks separated by “knots”), are low-degree polynomials, such as quadratics or cubics. At the knots, they are arranged to join smoothly so that a smooth function is created over the full range. In this analysis, very simple polynomials were used, namely B splines. Details can be found in mathematical texts such as that by Dierckx.19 Knots were placed at months 0, 3, 6, 9, and 12, and smoothness was made a requirement of the mathematical transformation, similar to the procedure first suggested by O'sullivan.20 For those interested in the mathematical details, fifth-degree polynomial B splines were used and smoothness was ensured by penalizing the fourth derivative.21 This permitted the exploration of anemia control with phase plots (vide infra). The trajectory of Hb over time can be represented by an appropriate B-spline waveform. It was useful to see how each trajectory had been controlled around the optimum Hb value (11.5 g/dl in this study). Perfect control shows the trajectory as a horizontal straight line at the optimum Hb. When the trajectory varies from the ideal, less control becomes evident, whereby the Hb value must be coerced, through epoetin dosage changes, back toward the optimum. For control purposes, the rates of change (slopes) of the trajectory give useful information and can be calculated from the trajectory by taking “derivatives.” The first derivative of the Hb function, the slope, has notionally units of “g/dl per mo.” A graph of this slope plotted against the Hb value in a “phase plot” starts to reveal the dynamics of control in the system. It can be helpful to consider an analogy for those who are unfamiliar with these concepts. A pendulum swings with greatest velocity at the lowest point of its travel, when its kinetic energy is largest. At the same point, the pendulum bob is at its lowest position, and its potential energy is lowest. Note that the position of the pendulum bob is analogous to the level of Hb and the velocity of the pendulum is analogous to the slope (rate of change) of the Hb trajectory. At either end of its swing, the pendulum velocity is instantaneously zero, so its kinetic energy takes its lowest value of zero. At these points, the potential energy is highest because the bob is at its highest elevation. Thus, during its swing, the pendulum exchanges energy from kinetic to potential and back again. Where the pendulum point velocity and position are related graphically in a phase plot, such a sequence of energy exchange corresponds to something like a circle, with a center of minimum potential energy.22 At the start, these circles are large. As friction acts, however, the pendulum makes smaller swings and the total energy declines; the circle becomes a spiral and progresses inward to the center. A system displaying large circles in a phase plot can be considered to have a lot of overall “energy.” In terms of the analogy of Hb trajectory, a large circle reflects little/poor control (wasted energy), whereas small phase circles correspond to less overall energy, reflecting close/good Hb control. Such circles and spirals in the control of renal anemia are centered on the optimum Hb value. A variation of this control analysis would be to consider phase plots of the second derivative, the rate of change of the slope (“acceleration”) in units of g/dl per mo, against the first derivative (“velocity”). Very similar results and identical conclusions are obtained, so this added complexity is not merited. One purpose of the original study was to compare patient responses to the two epoetins: Darbepoetin and epoetin β. Thinking in functional terms, it was desirable to compare the trajectories of all patients who received darbepoetin with those who received epoetin β. A plot of the two group mean trajectories can be derived, together with 68% confidence limits. These envelopes indicate the region of the graph where the trajectory is within 1.0 SE of the relevant group mean trajectory. Consequently, when the envelopes fail to overlap, the two group mean trajectories are separated by at least “2 SE” (1 SE from each group). Such a plot therefore indicates where the mean trajectories differed significantly from one another. The phase plots reveal the degree of control of individual patients under the treatment system through graphic display. Quantifying the key aspect of the phase plot and Hb trajectory, namely the absolute slope of the trajectory, advances the concept. If the slope of a patient's Hb trajectory is too steep, upward or downward, then the implication is that the patient's Hb is poorly controlled. If this continues, then large circles will become apparent in the patient's phase plot. In deliberately using largely unselected patients, their responses were not necessarily controlled at the desired Hb level at the start of the study period, and some treatment time was required to establish control. Therefore, the average absolute slope of the trajectory, which is the average absolute first derivative of Hb, during the final 6 mo, was taken to define “patient instability.” Patients whose Hb is kept well under control will show small instability values, whereas those whose Hb oscillates considerably around the desired range will have large values of instability. We are grateful to Cherry Bartlett and Dr. Donald Richardson for work on the original study. The support of K.H. and the publication by the Yorkshire Kidney Research Fund is gratefully acknowledged. The CDSS for the management of renal anemia has been further developed in collaboration with Media Innovations Limited, a technology transfer company jointly owned by the University of Leeds, UK, and the National Health Service. Information is available on their web site, http://www.media-innovations.ltd.uk, or by correspondence with the authors. See the related editorial, “Hemoglobin Variability in Dialysis Patients,” on pages 2218–2220.